You might have already heard about the new(ish) "hidden object" Great Gatsby video game, but did you know there is also an NES video game? You can play the game, allegedly found at a garage sale, online at GreatGatsbyGame.Com. Most people suspect this is not an authentic NES game but something made up by some Nintendo fans with too much time on their hands (actually, the website's contact page admits it's a fake created by Charlie Hoey and Pete Smith). At any rate, it's an enjoyable time-waster, with appropriately ridiculous touches such as a gold hat as the equivalent of Mario's mushrooms and Dr. Eckleburg's giant laser-shooting spectacles. I haven't played the game through (those giant laser-shooting eyes are tricky, and I'm no gamer) so I don't know how it turns out for Nick, or who else he has to fight later on (Dutch ghosts, apparently). 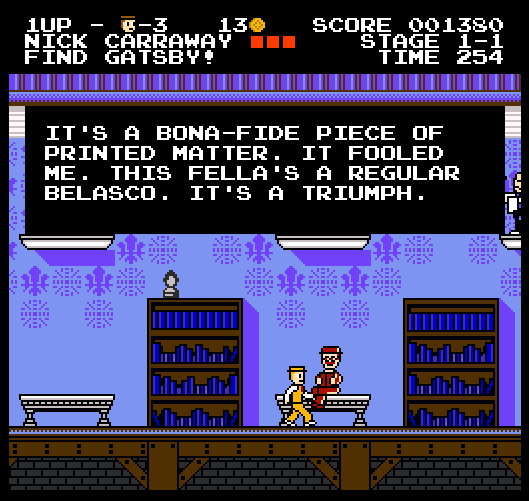 Now let's wait for the brave and bored fan who'll make Ulysses: The Game.